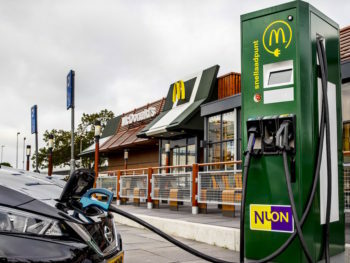 McDonald’s branches across the Netherlands will be kitted out with fast charging points by the end of 2021. The agreement with energy firm Nuon will see the installation of 168 fast charging stations, each with two fast charging points, get underway from the end of 2018 under a three-year programme. The charging stations will use renewable electricity fully generated by Dutch wind turbines and are being installed in response to rising charging demand in the Netherlands. Figures published by CBS (Statistics Netherlands) show nearly 22 thousand fully electric vehicles were on the road in the Netherlands at the start of the year, up almost 60% to a year previously. McDonald’s said the deal form part of its work to make its restaurants more sustainable.